Please refer to our stock # 1-0578 when inquiring. 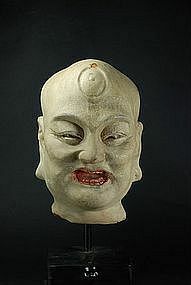 Head of a lohan (or arhat), its striking expression reflecting a profound inner happiness, with a third eye appearing on its forehead. Terracotta, with a plaster coating on which a white (for the whole face and neck), dark (for the eyebrows), and red (for the lips and mouth) pigment is applied. China, Ming Dynasty Period, maybe earlier. Height: 9" (23 cm). The head is nicely mounted on a custom metal stand. Some and small flaking on forehead and top of head, old and fine restoration at the base of the head and at the neck, otherwise very good condition. Ex. Old French collection. A stunning and rather rare piece. NOTE: Lohans, or arhats in sanscript, were disciples of Buddha. There were supposed to be 16 or 18.